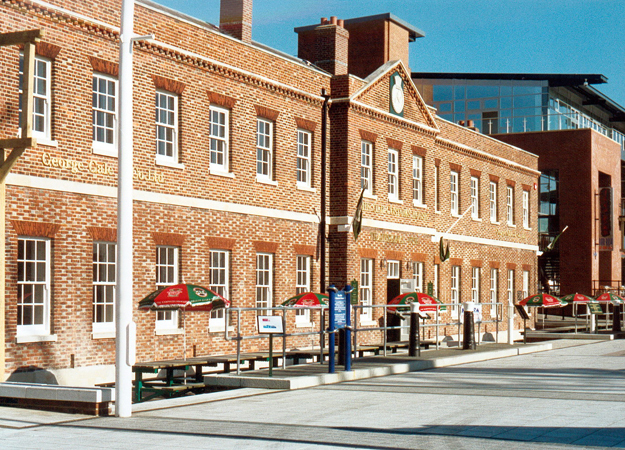 HMS Vernon, a national Scheduled Monument, is a unique part of the historic naval dockyard at Portsmouth, redeveloped to create the Gunwharf Quays centre. 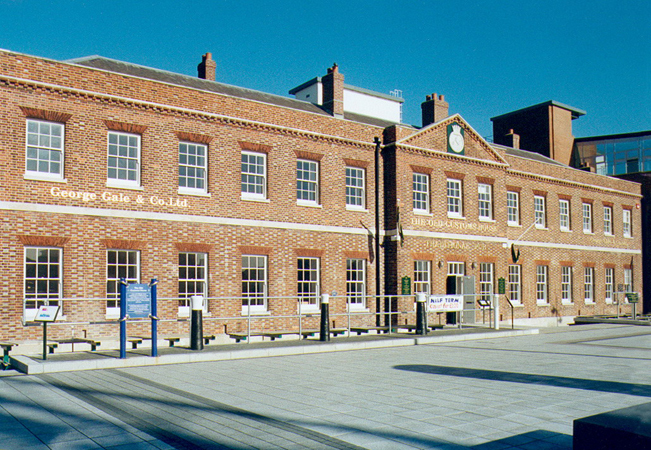 However The Vernon building itself, the historic birthplace of all mine, torpedo, submarine warfare and defence was restored and converted into the "flagship" operation for Hampshire Brewers, George Gale and Co of Horndean, now part of the Fullers Group. George Gale and Co. appointed the practice to specify and control the restoration programme, in close co-operation with English Heritage and to design the interior fit-out, to provide a high quality bar and ground and first floor restaurants. HMS Vernon, built in 1790, is presumed by English Heritage to be the very first recorded, purpose built office building. The Scheduled Monument consent that was obtained for the restoration and conversion took some five months of close consultation and negotiation with English Heritage, who were extremely supportive and appreciative of the very sympathetic approach shown by the design team. The completed building, of around 1000 sq.m in floor area, is fully air-conditioned throughout, centrally controlled and provides a licensed area of 600 sq.m. Externally, a private dropped terrace area wraps around two sides of the building, providing seating for over 200 people. Internally, the building comprises a range of rooms on both floors and as part of the approval given by EH, the rooms were to be left intact, including the doors, a number of which retained the original door furniture. Compartmentation posed a considerable design problem, to open and access all areas freely for customers, whilst retaining the integrity of the historic form. 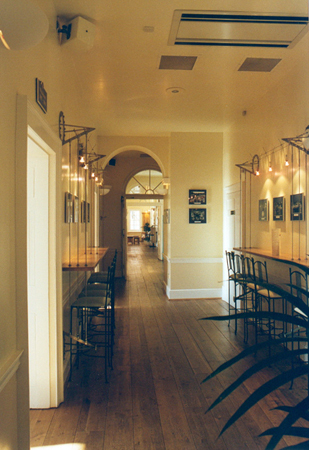 The series of rooms was the inspiration for the design, each space having its own identity, using a particular period of the building's history, told by a story board in that room. The building fabric, comprises solid brick walls, with parapets and shallow slate covered pitched roofs. The windows, mainly large vertical sliding sashes, but with a number of occuli windows, are of high quality and original and needed little more than an overhaul with new ropes, pulleys and weights. The matching of the brickwork was another problem to solve, in that the existing walls have as many as twenty different bricks in any small area. This was achieved by mixing four brick types and blending with stains. All new work was constructed using traditional lime mortar, with all existing walls re-pointed using lime putty. Lime was also used for the plaster internally, traditionally prepared with horse hair. The large and multi-flue chimneys, taken down below the roof long ago, were rebuilt in the process of stripping and restoring the roof, along with its many lead gutters and valleys. Despite the restraint in interior fit-out, allowing the original building to be fully enjoyed, the latest technology for communications, operations, security, sound and safety were employed. 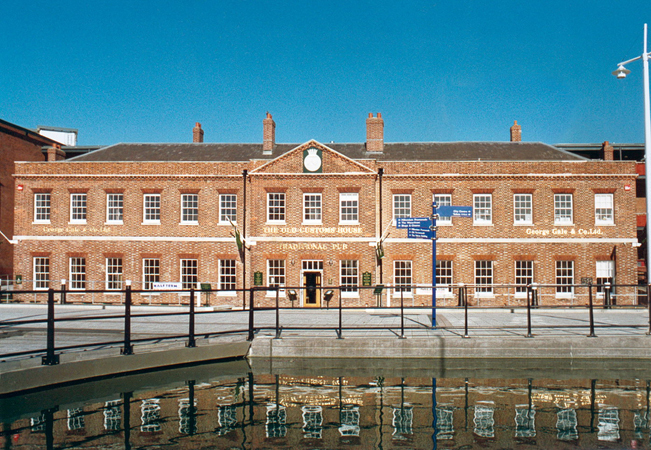 HMS Vernon is now known as 'The Old Customs House' and was awarded the Portsmouth City Society prize for restoration in 2001. It is almost as much museum as bar and restaurant, with the history of the site recorded and displayed throughout the building.